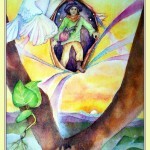 The Fool initiates the journey of the Tarot. His impulsive step into the unknown catapults the events and experiences of the Major Archana cards that ultimately lead to growth, self discovery and refinement. 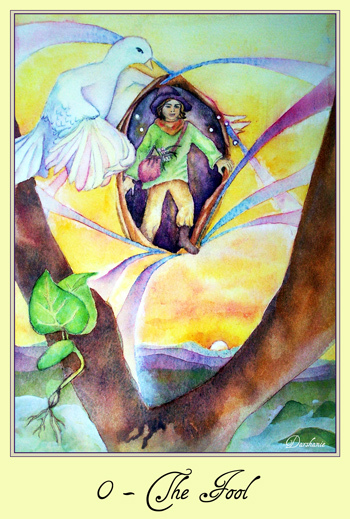 The Fool card is propelled by the inborn urge of the Soul to move forward, explore, expand, grow and become. It is the energy of life itself which never wants to be stagnant as life is an expression of curiosity, flow and seeking. The Fool is carried by this impulse and with it he takes the monumental step and begins his journey. The Fool card is expressed by the Zero, a most mystical number. Zero represents nothing, the void, and at the same time the possibility of everything. Zero is the Bindu, a point plucked out of infinite field of potentiality in its very first expression as a point of origin. As experience unfolds, it does so in a spiral pattern; it moves forward but always circles back to the Zero place. But things can never be the same; experience and awareness changes everything and so, even though time finds its way back to the zero point, it is by virtue of the journey, one level higher. Numbers reflect this spiral structure. We start with 0 and count up to 9. At 10 we find we’ve looped back to the 0 point, but with the added value of all the preceding numbers, it carries a higher level in value. This journey is infinite. The symbolism within this card communicates the patterning of The Fool. The Bindu, the infinitesimal point has expanded, creating a circular opening through which The Fool may emerge. The energy of this action liberates immense creative energies, illustrated as bands of radiating color. Beginnings are echoed in the sunrise, and the sprouting seed. The Fool himself is a young boy, still in the process of becoming. His innocence is symbolized by the white flowers he carries. He is young and what little experience he has he carries with him in his little bag. He is able to take this step because he trusts the universe and the universe takes care of him. He has divine protection in the form of the dove which is his Higher Self that is overseeing this journey and also the little lights, his guides that accompany him. Beginnings and the energy of The Fool is present in many situations. It is there at the beginning of a new relationship, education, business, move, birth, or journey. Every day and every moment can be an opportunity for a new beginning. The Fool risks; he steps into the flow of life and is forever changed. At a bigger level The Fool’s journey is the journey of our Soul. It takes the risk of entering this world. Anything can happen but through it all, the Soul experiences and learns about itself and so, is forever changed. This entry was posted in Major Arcana, Tarot on April 19, 2013 by darshanie.